I’ve been trying to incorporate more fruits and veggies into my diet, but I’m not really the steamed broccoli with dinner type. I mean, I’ll do it, but a healthier option would never be first choice. Kinda sad, isn’t it? Fries always beat out the “seasonal veggies” at restaurants. What can I say? In my quest to eat more veggies, I found myself with an eggplant in the refrigerator. 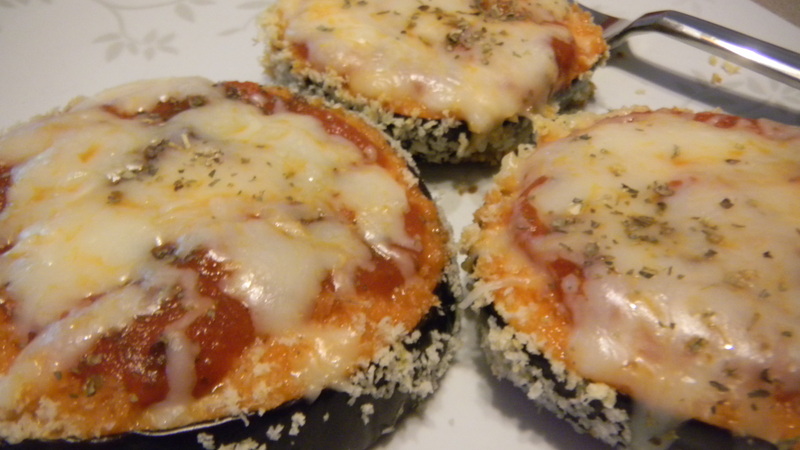 The only meal that comes to mind using eggplant is Eggplant Parmesan, and I’m pretty sure all that heavy sauce and gobs of cheese would negate the whole point of me eating an eggplant in the first place, so I opted against it. 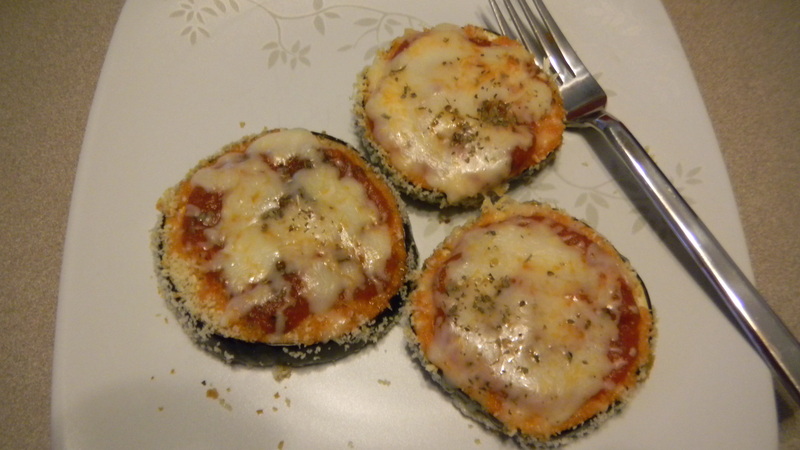 I can’t completely cut cheese our of my diet though, so I improvised a little and made mini eggplant slice pizzas. 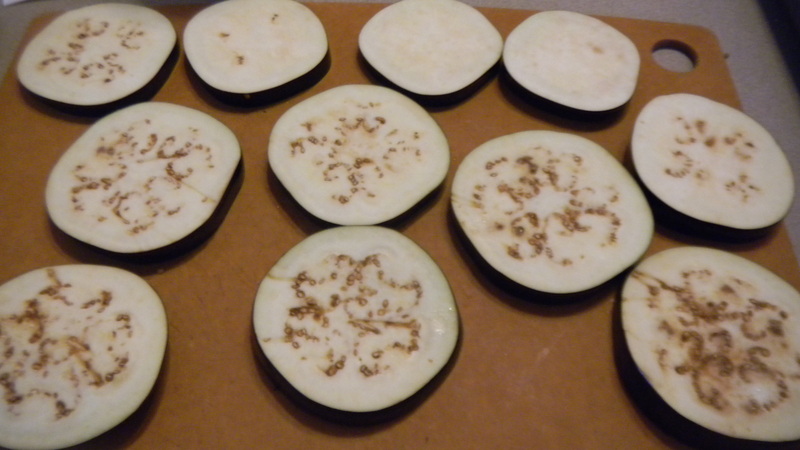 I started by cutting the eggplant into large slices. I sprinkled some salt over them, waited about 10 minutes, then pressed down on them with a paper towel. It helps remove some of the excess water, which makes the mini pizzas not so soggy. Next, dip an eggplant slice in the egg. Cover both sides, then dip it in the breadcrumbs. 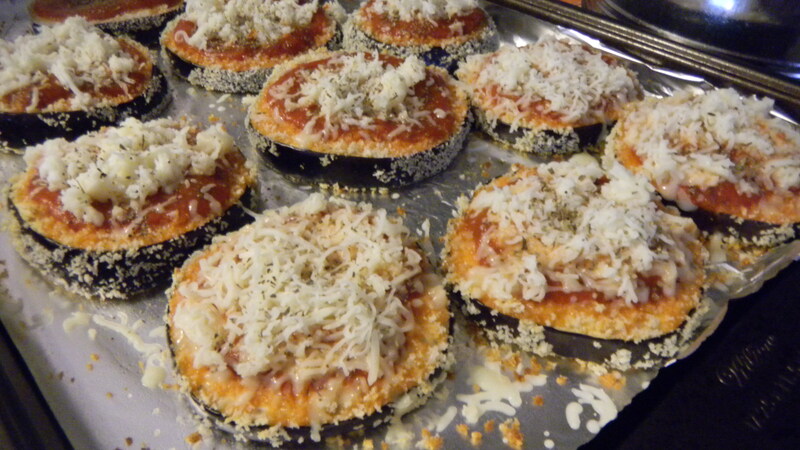 Make sure to cover the eggplant slice the best you can. Place each on a foil covered (and cooking sprayed) baking sheet. Bake them plain for about 20-25 minutes at 350 degrees. You will want them to be soft enough to poke through with a fork. When ready, take the slices out of the oven and add your toppings – sauce, cheese, seasoning, and everything else. We didn’t have much on hand, but use what you have: olives, pepperoni, mushrooms, artichokes, etc. To make them not as healthy, but very tasty, substitute goat cheese for the skim mozzarella. I had a bite of Dan’s made this way, and it was delicious.